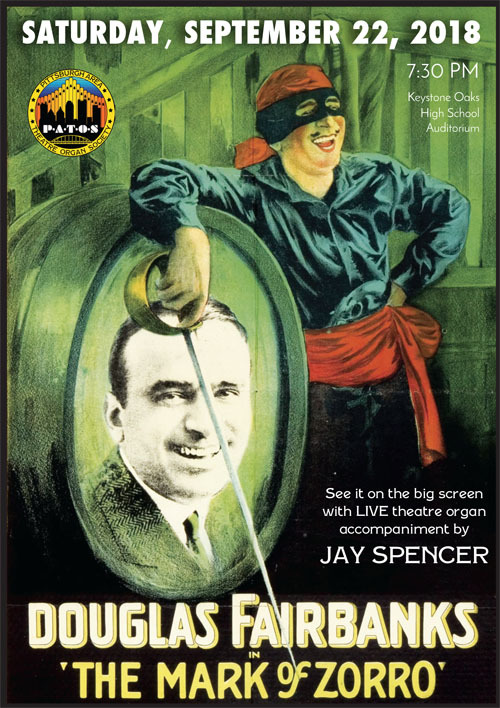 The Mark of Zorro, a swashbuckling 1920 silent film starring Douglas Fairbanks, will be presented with live theatre organ accompaniment on Saturday, September 22, 2018, 7:30pm at Keystone Oaks Auditorium in Dormont. Silent film organist Jay Spencer, the house organist at the Palace Theatre in Canton, Ohio, will accompany this landmark film on the 3 manual PATOS Wurlitzer theatre organ. This is the film that launched the movie career of Douglas Fairbanks. He was a 1920s screen idol famous for playing action heroes in such pictures as “Robin Hood,” “The Black Pirate,” and “The Three Musketeers.” His marriage to another screen idol, Mary Pickford, was the most famous in Hollywood, affording both even more popularity among the film-going masses. The love of organ runs deep in Jay Spencer’s family, too. “Both sets of my grandparents owned organs, and my dad’s mom played piano for silent movies in the 1920s.” Jay also has three organs in his own home. To purchase tickets, please click on the following link: www.showclix.com/event/MarkofZorro. Admission is $15 in advance, or $20 at the door. Students are free with ID. 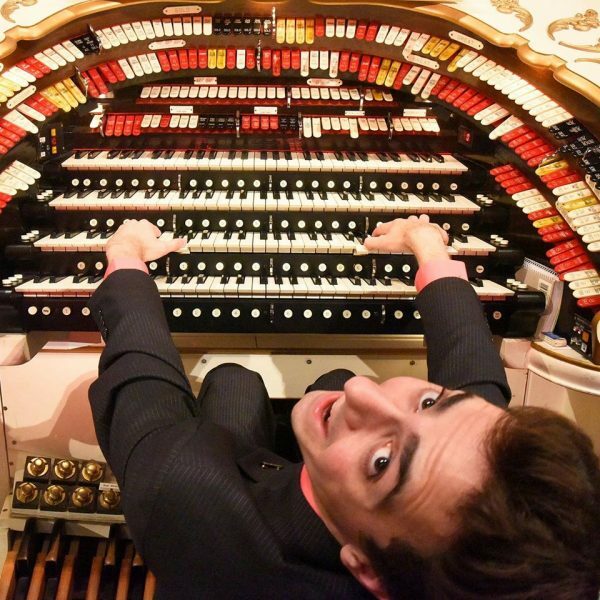 The always energetic organist Nathan Avakian returns to Pittsburgh with his presentation of International Youth Silent Film shorts, along with solo concert selections. Nathan’s silent shorts were filmed by youth under his tutelage just a couple of years ago. A rarity: silent films made in the 21st century! Nathan will accompany six films live on the PATOS Mighty Wurlitzer theatre organ. Nathan, just 26 years old, will also present modern musical selections from his youthful repertoire between the silent shorts. Don’t miss the opportunity to hear theatre pipe organ music with a modern update! To purchase tickets, please click on the following link: https://www.showclix.com/event/NathanAvakianIYSF. Admission is $15 in advance, or $20 at the door. Students are free with ID. Click here to purchase tickets online or visit the ticketing page for more information, including how to order tickets by mail. Click here to sign up for our email list to be notified of PATOS concerts and events. We will never share your email address with anyone. Please consider joining PATOS. Download the membership application (PDF) or visit the membership page for more information. PATOS is incorporated in the state of Pennsylvania and is a non-profit 501(c)(3) organization. To make a tax deductible donation, please email us. © Pittsburgh Area Theatre Organ Society. All rights reserved. Website design by Jeff Guerrero. Photography courtesy of Lance Luce.